The main difference between northbridge and southbridge is that the northbridge is a chip in the chipset of a motherboard that directly connects to the CPU while the southbridge is a chip in the chipset of a motherboard that does not directly connects to the CPU. Modern computers are electronic devices that are designed to perform multiple tasks. There are various components in a computer. The CPU or the processor manages the functionalities of the other components. A motherboard is a Printed Circuit Board (PCB) that allows communication between various components of the system. A motherboard consists of a chipset. Northbridge and southbridge are two chips in that chipset. High-speed components are connected to the northbridge while lower speed components are connected to the southbridge. A motherboard is a PCB that connects all components of the computer. In older computers, all the chips were spread across the motherboard. In modern computers, the number of chips is reduced and centralized into particular locations. Therefore, multiple chips are combined together to form one single chip. This chip that can replace a large number of chips is called a chipset. There is a chipset in the motherboard. Chipset handles the communication between various components such as CPU, peripherals, and buses. Northbridge and southbridge are two chips in the chipset. Northbridge is located in the northern section of the motherboard. It is also known as the host bridge. It is directly connected to the CPU, RAM, AGP, and PCI Express slots. If it is required for the CPU to communicate with AGP or PCI express slots etc., the communication occurs via the northbridge. Usually, northbridge operates at a faster speed as it connects to high-speed components in the computer. Southbridge is located in the southern section of the motherboard. It connects the components such as PCI bus slots, BIOS, SATA and IDE connectors and USB ports. There is no direct connection between the CPU and the southern section of the motherboard. If components like PCI, USB etc. need to communicate with the CPU, the information has to go through the southbridge, then northbridge and finally to the CPU. A northbridge is a chip in the core logic chipset architecture on the northern section of the PC motherboard. A southbridge is a chip in the core logic chipset architecture on the southern section of the PC motherboard. This is the basic difference between northbridge and southbridge. 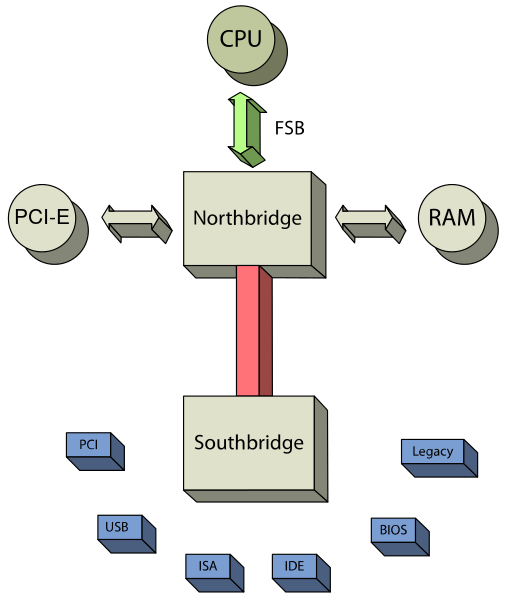 As their names indicate, northbridge is located in the northern section of the motherboard while southbridge is located in the southern section of the motherboard. The main difference between northbridge and southbridge is in the connection to the CPU. While northbridge is directly connected to the CPU, southbridge connects to the CPU via the northbridge. Northbridge connects to the CPU, RAM, AGP, PCI Express slots and southbridge. On the other hand, southbridge connects to the PCI bus slots, BIOS, SATA and IDE connectors, USB ports and northbridge. Moreover, northbridge operates faster than southbridge. 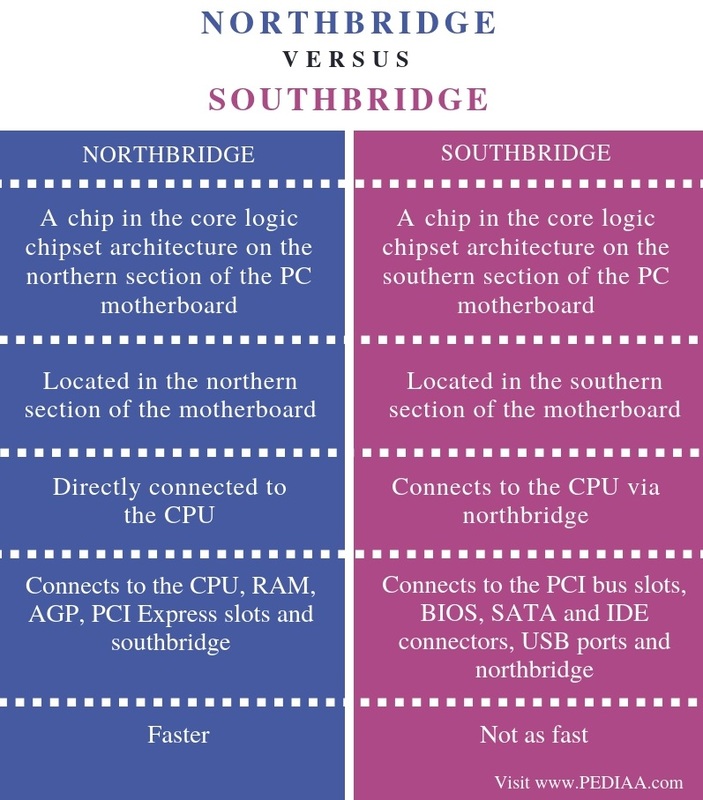 The difference between northbridge and southbridge is that northbridge is a chip in the chipset of a motherboard that directly connects to the CPU while Southbridge is a chip in the chipset of a motherboard that does not directly connect to the CPU. In brief, northbridge connects to faster components and southbridge connects to the slower components. 1. What Is a Chipset?, PowerCert Animated Videos, 26 June 2016, Available here.